What Michael Brown is hiding from his audience (Part 2): Damning 2010 audio proving Brown’s knowledge & involvement in the NAR. Home › Line of Fire › What Michael Brown is hiding from his audience (Part 2): Damning 2010 audio proving Brown’s knowledge & involvement in the NAR. Resource: How to Recognize Lies. “I’ve also challenged those who hide behind a cloak of anonymity online, and post blatant falsehoods, blatant falsehoods. 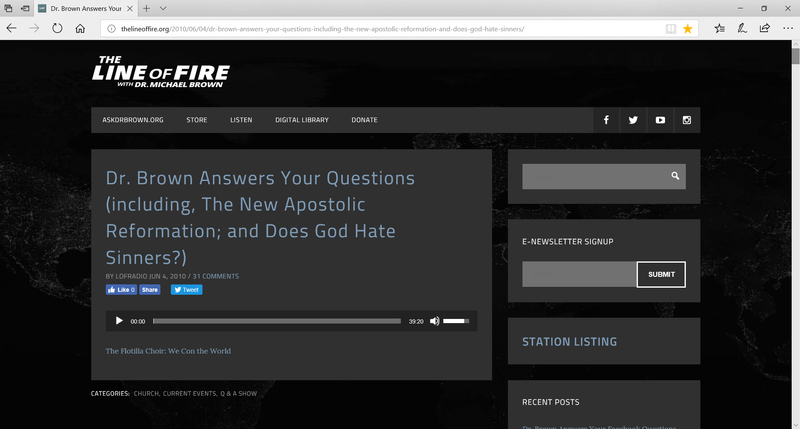 I mean one website, I’m not even going to mention it on the radio, I don’t even want to draw any attention to it, but it blasts me as a ‘New Apostolic Reformation Apostle’. Please explain? When have I claimed to be an apostle? When have I worked with Dr Peter Wagner- side by side and part of his organisation? I don’t even know what people are talking about. And they will post things that are just blatantly false, just false information. … one website brands me an, ‘NAR Apostle’, actually ‘NARpostle’. That’s cute. What’s it supposed to mean? I’m not an apostle. I’ve never claimed to be an apostle. And I’m not part of the “New Apostolic Reformation”. […] Please give me a call if you have questions, concerns, issues with the so called New Apostolic Reformation. What is it? Is it of God or man or the devil? Please give me a call, I would love to hear from you [phone number]…. Recently, Chris Rosebrough from Fighting For the Faith, played audio of Michael Brown once again denying the existence of the NAR and his involvement with it on the Naked Bible podcast. We covered Brown’s lies on the subject here. Michael Brown capitalizing on people’s ignorance to lie about the New Apostolic Reformation. We managed to track down and obtain the audio. The transcript is below. Ah, Debbie there’s certainly a lot of controversy concerning what is called The New Apostolic Reformation. I have taught in the past at Peter Wagner’s Leadership Institute, taught a class there on revival years ago. Have had some fellowship with Peter Wagner, and discussed different doctrinal issues, bounced things off one another. And without question, what is called the New Apostolic Reformation is one of the most controversial things associated with Dr Peter Wagner, who for years was a missionary. And then a Professor in church growth at Fuller Theological Seminary, continues to travel the world and teach and preach. Let me tell you what I think is positive, let me tell you where I have concerns. What is positive is that Peter Wagner and others have reminded us that in the New Testament there is not just one leadership office called Pastor. The New Testament recognises Apostle, Prophet, Evangelist, Pastor, teacher. These different ministries, these different gifts, these different callings and anointing’s put within the body, for the edification of the Saints, and they make an excellent argument that Apostles and Prophets were just not for New Testament times, but continue beyond. That there were the twelve Apostles, the twelve, period, the big ‘A’ Apostles as we would say. But then there were small apostles, if you just research the word ‘apostle’ in the New Testament, you’ll find a good number of other people called ‘apostles’ that were not of the twelve. Remember the word ‘apostle’ literally means an emissary, a sent one. And there were those that had a foundational role that no one else has had, the first twelve, you may include Paul in that number otherwise Matthias in the first twelve. To the point that the book of Revelation, it tells us that the foundations, the twelve foundations of the new city of Jerusalem. The New Jerusalem will have the names of the twelve Apostles. So their role, their calling, their function in the body is never to be repeated. But there is what we call small ‘a’ apostles, people who are emissaries, who were planters, builders, people who may have overseen numbers of works in different locations, pioneers in different ways. That there were others aside from the twelve, the New Testament makes reference to prophets and speaks of them as something ongoing until we come to the complete maturity in the faith, and complete unity in the faith. So today we have a notion, especially in the West that there’s one official office, and that’s Pastor, and only Pastor, and the Pastor has to do everything and be everything. The Pastor’s the Evangelist, the Pastor is the teacher, the Pastor has to bring the prophetic insights. And that’s why a lot of Pastors burn out, because there’s so much expectation put on them, as opposed to saying, hey there’s a senior leader on our team, but there are others involved who are gifted and called and anointed as well. So, in that sense Debbie, there’s a lot of good that’s been done to draw attention to contemporary Apostolic Ministry, and to recognise that some people really do have this pioneer, building, apostolic kind of call. Maybe we haven’t recognised it, maybe we’ve put other names on it, maybe we’ve said so and so is a church planter, or so and so has planted thirty churches overseas and oversees those churches overseas. And we haven’t recognised a certain apostolic anointing on that person’s life, I think that’s been positive. So to be truly Apostolic, without having a real measure of suffering, I don’t mean cancer or car wrecks, but I mean suffering persecution, opposition for Jesus. I don’t believe you can be Apostolic in a New Testament sense without that. ‹ Fruit of Bethel – Jen Hodge threatens Christians, repeatedly lies; uses image of Christ on ‘destiny/tarot’ cards.